The official album with all 10 songs from the 2009 Dansk Melodi Grand Prix is becoming a best seller, as usual. The charts also reveal that the re-lease of the 2008 album from Brinck, who won the Danish national final, is selling well. The Danish album top40 includes several Eurovision Song Contest connections. 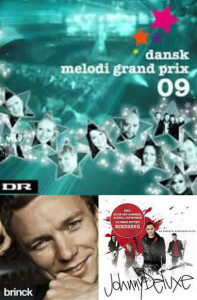 This year’s Danish final, the 2009 Dansk Melodi Grand Prix was popular among the viewers with a market share of 71% and now it is clear that the album is just as popular. It was released three weeks ago and went straight into a 16th position on the album top40. Last week it topped as being the most sold album and on its third week it is second on the list, only beaten by Bruce Springsteen. The Danish winner Brinck who will represent Denmark at the 2009 Eurovision Song Contest in Moscow has recently re-released his 2008 album including Believe Again and two other new songs. This album is also selling well. In total the album has had 9 weeks on the Danish album top40, but it is only the last two weeks that covers the new edition. In the weeks just before the Danish final his album was not to be found on the list. He rejoined the list last week bringing the new release straight into a third position. In this week he has managed to maintain that position which is also its highest peak. A similar thing is happening with the re-release of the latest album from Johnny Deluxe who ended on a tied third position in the Danish final being knocked out in a direct duel against Brinck’s Believe Again. They have also released their 2008 album to include the Melodi Grand Prix song Sindssyg and just like Brinck then they also re-joined the list over the 40 most sold albums last week. Johnny Deluxe got back into the list as number 35, but has crawled up a bit now being the 28th most sold album. The album top40 also includes a joined album including songs from the three best at the MGP 2008, the Danish junior show. It joined the list last week as #33, but is on its second week to be found at #17. The duo Hej Matamatik consists of Søren Rasted from Aqua (Interval act for the 2001 Eurovision Song Contest held in Copenhagen) and his nephew Nicolaj Rasted. They have spent a total of 30 weeks on the chart for their album Vi Burde Ses Noget Mere and is this week number 19th. Kim Larsen who participated in the 1978 Dansk Melodi Grand Prix is #32 after 18 weeks on the list with the album Glemmebogen For Børn. There is also a few international Eurovision Song Contest connections as Celine Dion, who won the 1988 Eurovision Song Contest, currently is #35 after 16 weeks on the list with the album My Love – The Essential Collection. The soundtrack from Mamma Mia, including ABBA’s music, is closing as #40 after 29 weeks on the list. Next to the album top40 the Tracklist, that covers single track downloads, three songs from the 2009 Dansk Melodi Grand Prix is to be found on the top40. The winning song from Brinck Believe Again is once again third after being number one last week. Sukkerchok that made it to the last four in the Danish final losing to Hera Björk’s Someday in a direct knockout duel, is to be found as 7th on the Tracklist top 40 with their entry Det Det being 5th last week. They however also have another song on this list as the single Hvor Som Helst – Når Som Helst is this week’s #10. Johnny Deluxe’s Sindssyg was 8th last week, but has fallen down to #21. Danish singer Sanne Salomonsen, who participated in the 2005 Melodifestivalen, is 11th on the Tracklist top40 with the single Taxa.